Until now, Nagi’s owner Kei has transported these products from Japan himself, so it was difficult to offer them for purchase, but now you can buy them here in the salon. Both of the smart beauty devices (the hairdryers and hair irons) are different from typical tools like hair dryers and hair irons, in that they are equipped with a technology called bioprogramming which gives hair more shine the more you use it. The image below shows a demonstration. It may be hard to believe, but they are completely different from normal hair dryers and hair irons. The most important part of hair care is a good regular care routine, so changing your daily tools to quality ones is most effective. If you choose to purchase Lumielina smart hair devices (tools) at Nagi Hair, we recommend coming to the salon to try out these devices ( hairdryer, curling iron, or straightening iron) and experience them for yourself before making your purchase. 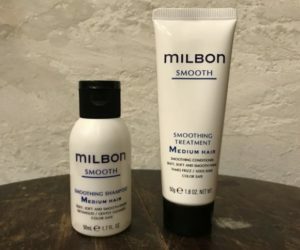 With your purchase you will also receive a complimentary travel size Milbon silk protein shampoo and treatment pack.